After months of speculation, The BBC has confirmed today the new series of Doctor Who is moving to Sunday evenings. 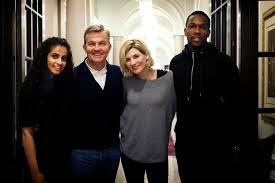 Series 11 will debut in the UK on Sunday 7th October. The move to Sunday evenings is seen as a controversial choice, by some fans. Saturday nights has been home to Doctor Who, since its return in 2005. Previously, the only times the series has been shown on a Sunday was for two episodes shown on Christmas Day and the David Tennant special, The Waters of Mars. The switch means that Doctor Who will avoid ITV’s X Factor. A timeslot has yet to confirmed, but my money is on it being broadcast between Countryfile and the Strictly Come Dancing Results show.